Daily HFT Trade Setup - USDJPY at HFT buy zone! 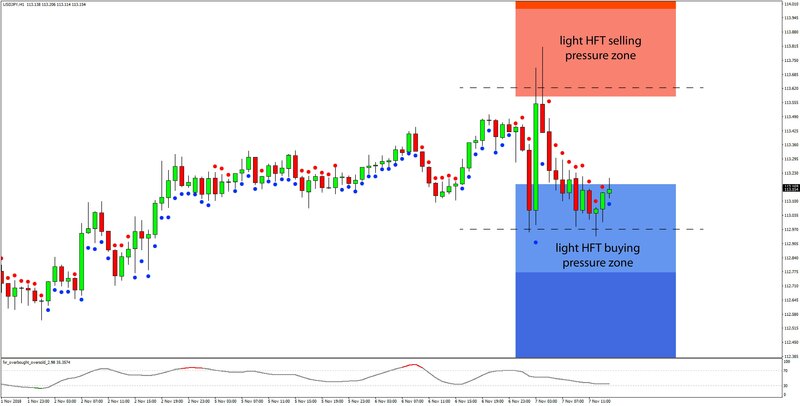 Analysis of the trading activity of HFT algorithms in the Fx market today shows that the USDJPY currency pair has found support inside of the light HFT buying pressure zone that is noted at 113.18 and below. The price has managed to pierce down through the 113.00 round number support but it has rebounded back higher every time today. This type of price action suggests there are good chances that the support will hold and USDJPY will continue with a move higher toward the next resistance zone. The next resistance higher is found at the daily highs in the 113.50 price area and inside of the light HFT selling pressure zone that is today noted at 113.58 and above. Traders can use these price levels for placing profit targets today.